Inter Milan have issued a statement confirming that, after a few days of limbo, Rafa Benitez has officially been relieved of his duties at the Guiseppe Meazza after the two parties finally reached an agreement over the financial terms of the Spaniard’s dismissal. “Inter Milan and Rafael Benitez can announce that they have reached a mutually satisfactory agreement for the early termination of his contract. Benitez is understood to have agreed a €5.5 million pay-off with Inter owner Massimo Moratti which, when coupled with the £4 million odd he received as a result of being prematurely canned by Liverpool in June, suddenly makes a career as a middling, ill-fated manager seem like a very tempting prospect indeed. Rafa back to Liverpool, Woy back to Fulham, Sparky back to Blackburn, Big Sam to finally fulfil his destiny at Inter? Just a thought. it took inter 6 months to figure out what liverpool took 6 years to understand aka rafa is a joke. BIG SAM TO INTER. MANIFEST DESTINY. I’m having a good laugh about this. Since Benitez still owns a home in Merseyside, maybe he can go on to coach the side that’s on his level: Tranmere Rovers. Don’t jump to conclusions so quickly. Although I’m not denying that Rafa definitely has to shoulder a lot of the blame for Inter’s poor season, it is not entirely his fault. How much can you do when your squad is full of injuries, and add that to the fact that he just lost their brightest talent in Balotelli but yet not given any chance whatsoever by the owner to buy more players to strengthen the squad? Can someone fire me please? Just amazing haw he can get that much money just from being bad at what he does! Balotelli scored 11 goals in fourty games for Inter in his final season in all competitions. Hardly world class and if he played anything like he has at City this season im struggling to see where this ‘next big thing’ tag has come from. Sure the attributes are there but give me a Bale, Aguero, Pedro or Macheda any day of the week. 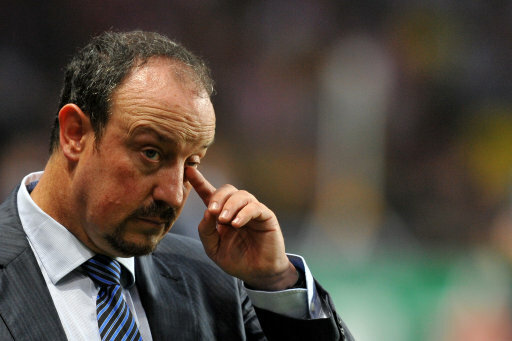 And as for Benitez he does himself absolutly no favours with his general demeanour. For all the excuses coming out of Anfield with regards to owners and in-fighting it was still Benitez who picked Lucas week in, week out, still him who decided it was ok to rely on Torres and Gerrard every week and still him who managed to turn Babel from a potential star into an average Prem player. So in my eyes hes gotta take the full proportion of the blame squarely on his shoulders. And incidently his biggest mistake?? The same one that the manager who folllows Sir Alex at OT will make. Not being Jose.